Artwork from the Kimba Ultra Edition DVD set. New Jungle Emperor: Go Ahead Leo! In Africa during the mid-20th century, as mankind encroaches, the white lion Panja (Caesar in the English dub) gives the jungle's wild animals a safe haven. However, he angers nearby villagers by stealing their cattle and their food to feed the jungle carnivores (in the English dub he merely frees the cattle). A professional hunter, Ham Egg (Viper Snakely in the English dub), is called in to stop these raids. He avoids directly attacking Panja. Instead, he records the sounds of Panja and uses them to trap his pregnant mate, Eliza, who then becomes bait in a trap for Panja. Panja is killed for his hide (but not before asking Eliza to name their child Leo), and Eliza is put on a ship, destined for a zoo. 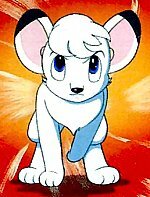 Leo (Kimba in the English dub[a]) is born on the ship. Eliza teaches him his father's ideals. As a huge tropical storm nears, she urges her cub out through the bars of her cage. The storm wrecks the ship, killing all the humans and animals on board (including his mother) and Leo starts to drown in the ocean. The fish help him learn to swim. As he begins to despair, the stars in the sky form the face of his mother, who encourages him. Guided by butterflies, he makes it to land. Leo lands far from his ancestral home and is found and cared for by some people. He learns the advantages of human culture, and decides that when he returns to his wild home he will bring culture to the jungle and stand for peace like his father. The show follows Leo's life after he returns to the wild, still a young cub, and how he learns and grows in the next year. Leo soon learns that only communication and mutual understanding between animals and humans will bring true peace. In 1950 the original Jungle Emperor story started in Manga Shōnen (Comic Boy) magazine. The first manga volume has been released bilingual (Japanese-English) as Jungle Emperor Leo – Leo Edition. The animated series was first broadcast in Japan on Fuji Television from October 6, 1965 to September 28, 1966. It was the first color TV anime series. Other than the original broadcast in Japan in 1965, the series has been broadcast in many countries around the world. In Asia, it was broadcast in Indonesia on Lativi, antv and SCTV (1995–96); in Iran on Channel 1; in the Philippines on ABC 5; in Saudi Arabia on Saudi TV and in Sri Lanka on ART TV. In Europe, it was broadcast in Bosnia and Herzegovina on RTVUSK; in Croatia on ATV Split/TV Jadran, Nezavisna televizija (NeT), TV Nova Pula and Gradska TV Zadar; in France on ORTF (1972) and on TF1; in Italy first in syndication from 1977 and lately on Italia 1 (in 1999 and 2003 with the title Una giungla di avventure per Kimba [literally "a jungle of adventures for Kimba"]) and Boing (2010) and in Spain on TV3. In North America, it was broadcast in Canada on Knowledge; in Mexico on Boomerang. It was broadcast, with English-dubbed voices, in the United States and other English-speaking markets, beginning on September 11, 1966. It was first commissioned for U.S. development by NBC Enterprises (the original version, now part of CBS Television Distribution) and adapted by Fred Ladd, for syndicated broadcast, with Kimba voiced by Billie Lou Watt. In 2005 the original 1965 dub of Kimba the White Lion was released as an 11-disc DVD set by Madman Anime of Australia and Right Stuf International of the U.S. It was a best seller. The series was re-dubbed into English in 1993, featuring the voice of Yvonne Murray as Kimba and having a new opening, with an all new soundtrack composed by Paul J. Zaza. In 2012 Bayview Entertainment/Widowmaker releases "Kimba the White Lion: The Complete Series" 10 DVD box set of the original 1965 series. It was broadcast several times in the United States: on KHJ-TV (1965–67; Billie Lou Watt dub), on NBC (1965–77, re-runs until 1980; Billie Lou Watt dub), on syndication (1965–77; Billie Lou Watt dub; 1993, re-runs until 1995; Yvonne Murray dub), on Kids & Teens TV (1993 re-runs; 2005–2009) and on Inspiration Life TV (1993 re-runs; 2005–2009). In Oceania, it was broadcast in Australia on ABC, 31 Brisbane and Access 31 and on the NZBC in New Zealand. The theatrical version of Jungle Emperor, directed by Eiichi Yamamoto, was released in Japan on July 31, 1966. A sequel series, Jungle Taitei: Susume Leo! (Jungle Emperor: Onward, Leo!) first aired in Japan on Fuji Television from October 5, 1966 to March 29, 1968, featuring Leo (Kimba) as an adult. It aired in the United States in 1984 as Leo the Lion on CBN Cable Network. In 1989 Dr. Osamu Tezuka died at age 60 on February 9. A remake of Jungle Emperor, The New Adventures of Kimba The White Lion was broadcast in Japan from October 12, 1989 to October 11, 1990. This series bears little resemblance to the original manga or the first TV series, as the plot is extremely different and the characters have been completely reworked and changed. 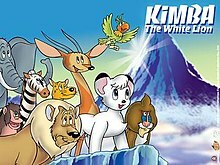 Several heavily edited episodes of the series were dubbed into English and released directly to video in 1998 under the name: The New Adventures of Kimba the White Lion, by Pioneer Family Entertainment. It features the voice of Brad Swaile as Kimba. In 1991 an original video animation film was created, using the Symphonic Poem for its audio. A new Jungle Taitei theatrical film, Jungle Emperor Leo, was released in Japan on August 1, 1997. Directed by Hiro Takeuchi, it is based on the second half of Dr. Tezuka's original manga story. It is not entirely faithful however. It was dubbed into English and released on DVD in 2003 under the name Jungle Emperor Leo by Anime Works. The film had a distribution income of ¥430 million ($5.39 million) at the Japanese box office in 1997. A television film, Jungle Taitei – Yūki ga Mirai wo Kaeru (ジャングル大帝　勇気が未来をかえる), aired in Japan on September 5, 2009 with a completely new story, different from both the previous TV shows and the original manga. The setting was an artificially created jungle in 20XX Earth. In this movie, Panja and his mate, Eliza, are still alive; Coco is an unspecified female bird; and Sylvester, the black panther, serves as an antagonist until he changes his ways when a young boy mends his leg. The music video for the song "A Boy" by Leo Ieiri, which has an animated part made by Tezuka Productions, features an anime version of the singer (based on Kimba and modeled after the singer) which meets other characters from the Kimba the White Lion series. Jungle Emperor characters have cameos in the GBA game Astro Boy: Omega Factor, as well as a chapter from the Black Jack manga and Naoki Urasawa's Pluto. In the Fox TV series Fringe, Kimba had a cameo in one of the episodes. The series uses several themes. The 1966 Japanese version uses an opening theme and a closing theme. The opening is called "Jungle-Taitei" (ジャングル大帝, Janguru-Taitei, "Jungle Emperor"). The end song is "Leo no Uta" (レオのうた, Reo no Uta, "Leo's Song"). For the Japanese remake, the opening song is "Savanna o Koete" (サバンナを越えて, Sabanna wo Koete, "Past the Savanna") sung by Ichiro Mizuki, and the ending is "Yūbae ni Nare" (夕映えになれ) sung by Tomoko Tokugai. The American theme was written by Bernie Baum, Bill Giant and Florence Kaye and sung by Bill Giant. The opening song for the sequel series is "Go Ahead Onward Leo!" written by Isao Tomita and sung by Mieko Hirota. The US-American theme song known as "Leo the Lion" was written by Mark Boccaccio and Susan Brunet of Miami, Florida's SONIC-Sound International Corporation in 1984. Jungle Emperor Symphonic Poem (by Isao Tomita) was released on LP in 1966. As a number of media journalists and fans watched Disney's animated feature film The Lion King they noticed characters and events in the story resembling those of Kimba. Although the two works follow different screenplays, there are strong artistic similarities, and The Lion King contains numerous sequences that closely match Kimba′s. Other similarities are thematically deeper and more pronounced, such as that both feature the theme of the circle of life. However, it should be noted that some claim The Lion King did not plagiarize Kimba the White Lion, stating that several of the similar characters in both works are different in several aspects, most importantly that of personality and role. Several have also stated that since Kimba the White Lion and The Lion King are both based on the Disney film Bambi, and the fact that both works are set within Africa, similarities of such magnitude are inevitable. It is also claimed that the rather primitive setting of both works leaves few options when it comes to portraying scenes of desperation and urgency. For example, in both The Lion King and Kimba the White Lion, there are similar scenes of a stampede, along with scenes of the protagonist character hanging from a cliff while the antagonist looms above. It’s said that due to the setting constraints of both works, lacking any sort of industry or technology, there are very few options to choose from when it comes to scenes of distress, and that something such as a stampede is one of the very few choices for such a setting and story. Several have also noted the complete absence of humans from the The Lion King, while Kimba the White Lion features humans prominently. More aggressive proponents claim that fans of Kimba the White Lion intentionally “cherry picked” scenes from The Lion King and Kimba the White Lion that appeared to be similar to discredit The Lion King, also claiming that because Kimba the White Lion is a series, there are more scenes to choose and therefore “cherry pick” from. Alleged similarities in the characters, beginning with the protagonist lion cubs Kimba and Simba, include the evil lions, the one-eyed Claw and Scar, the sage baboons Dan'l Baboon and Rafiki, the animated birds Pauley Cracker and Zazu, and the pair of hyena sidekicks (it was a trio in the Disney film). The Lion King co-director Rob Minkoff deflected criticism of similarities in the characters by stating it was "not unusual to have characters like a baboon, a bird or hyenas" in films set in Africa. Matthew Broderick has said that when he was hired as the voice of adult Simba in The Lion King, he presumed the project was related to Kimba the White Lion. "I thought he meant Kimba, who was a white lion in a cartoon when I was a little kid," said Broderick. "So I kept telling everybody I was going to play Kimba. I didn't really know anything about it, but I didn't really care." Animators Tom Sito and Mark Kausler, who both have story credits, have admitted to watching Kimba, and assumed many of their colleagues had too, especially if they grew up in the 1960s. Both films feature the protagonist looking up at clouds in the shape of his father lion, as pointed out by Frederick L. Schodt. The similarity is alluded to in a scene from The Simpsons ("'Round Springfield" episode), where a parody of Mufasa in the clouds tells Lisa Simpson, "You must avenge my death, Kimba...er, I mean Simba!". Upon the release of The Lion King in Japan, multiple Japanese cartoonists including Machiko Satonaka signed a letter urging the Walt Disney Company acknowledge due credit to Jungle Emperor Leo in the making of The Lion King. 488 Japanese cartoonists and animators signed the petition, which drew a protest in Japan, where Tezuka and Kimba are cultural icons. The Lion King director Roger Allers claimed he remained unfamiliar with Kimba throughout production until his film was nearly completed. However, Allers had previously lived in Tokyo and worked in animation there during the 1980s, when Tezuka had already become known as "Japan's Walt Disney" and a remake of Kimba was airing on prime time television. Co-director Rob Minkoff also claimed he was unfamiliar with Kimba. The Tezuka–Disney connection extends back decades before the movie. Tezuka met Walt Disney at the 1964 New York World's Fair, and Disney said he hoped to "make something just like" Tezuka's Astro Boy. Fred Ladd, who was involved early on with importing Kimba and other Japanese anime into America for NBC, expressed incredulity that Disney's people could remain ignorant. 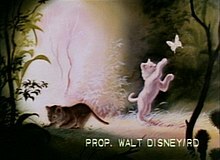 Ladd stated there was at least one animator remembered by his colleagues as being an avid Kimba fan and being quite vociferous about Disney's conduct during production. In 1967 the Jungle Emperor theatrical feature was awarded the St. Mark's Silver Lion Award at the 19th Venice International Film Festival. In 1978 the adult Leo character, designed by Tezuka himself, became the mascot for the Seibu Lions (current Saitama Seibu Lions) baseball team. The Leo mascot [ja] was used on the team baseball cap and helmet for decades Leo also appeared on the players' uniform for the 2014 season, designed by Tezuka Productions. The Seibu conglomerate-owned team's mascot became highly visible throughout Japan on baseball caps, shirts, etc., as well as being heavily used in advertisement especially in the Tokyo area. Frederick L. Schodt makes the argument that by the 1980s, Leo the lion could hardly escape the notice of foreign visitors to the city. ^ The name Kimba was adopted after Simba, meaning "lion" in Swahili was first suggested, according to Fred Ladd. The name "Leo" needed to be changed because it coincided with the name of the MGM lion. ^ "Kimba Boxed Set : DVD Talk Review of the DVD Video". Dvdtalk.com. Retrieved November 28, 2012. ^ "Kimba the White Lion Dub.DVD – Review". Anime News Network. Retrieved March 21, 2012. ^ "Tezuka Lion King | 'Lion King' recalls beast of another reign - Baltimore Sun". San Francisco Chronicle. Articles.baltimoresun.com. July 12, 1994. Retrieved February 21, 2015. ^ Schweizer & Schweizer (1998), p. 172. ^ "Eigo komikkusu janguru taitei (Leo hen)" 英語コミックス ジャングル大帝 (レオ編). Amazon. 2018. ^ "Bilingual Manga: Comics for language learners young and old". MetropolisJapan. April 22, 2014. ^ ジャングル大帝. Media Arts Database (in Japanese). Agency for Cultural Affairs. Retrieved April 10, 2015. ^ "Kimba The White Lion: History of the original series". Kimbawlion.com. Retrieved July 19, 2014. ^ ジャングル大帝進めレオ!. Media Arts Database (in Japanese). Agency for Cultural Affairs. Retrieved April 10, 2015. ^ アニメ交響詩ジャングル大帝. Media Arts Database (in Japanese). Agency for Cultural Affairs. Retrieved April 10, 2015. ^ ジャングル大帝 劇場版(1997). Media Arts Database (in Japanese). Agency for Cultural Affairs. Retrieved April 10, 2015. ^ "1997年邦画作品配給収入". Kinema Junpo. キネマ旬報社 (1998年（平成10年）2月下旬号): 168. 1998. ^ ジャングル大帝-勇気が未来をかえる-. Media Arts Database (in Japanese). Agency for Cultural Affairs. Retrieved April 10, 2015. ^ "TAF 2009: Osamu Tezuka's "Kimba the White Lion" to be renewed in summer 2009 – GIGAZINE". En.gigazine.net. March 19, 2009. Retrieved November 28, 2012. ^ "Crunchyroll – VIDEO: Leo Ieiri Collaborates with Osamu Tezuka's "Jungle Emperor" in the Latest PV". Crunchyroll. Retrieved March 13, 2014. ^ Patten (2004), pp. 159–161. ^ Schodt (2014), p. 158. ^ a b c Welkos, Robert W. (July 13, 1994). "A 'Kimba' Surprise for Disney : Movies: 'The Lion King' is a hit, but reported similarities to the Japanese-created American cartoon of the '60s are raising some questions". Los Angeles Times. Retrieved March 30, 2015. ^ Trish Ledoux and Doug Ranney, "The Complete Anime Guide: Japanese Animation Video Directory and Resource Guide", p. 16. ^ Buress, Charles. "Uproar Over 'The Lion King'", The San Francisco Chronicle, July 11, 1994, pp. A1, A13. ^ "Did Japanese Animator Inspire 'Lion King'? ", The Washington Times, July 15, 1994, p. C15. ^ Arar, Yardena (June 15, 1994). "Disney studios roar into action for 'Lion King'". Austin American-Statesman. Retrieved November 28, 2012. ^ Patten (2004), p. 159, note 53. ^ Mizoguchi, Kozo (August 10, 1994). "'Lion King' sparks debate in Japan". The Daily Gazette. Tokyo, Japan. Retrieved January 6, 2015. ^ Fiamma, Andrea (December 12, 2014). "Intervista a Roger Allers, il regista de Il Re Leone". Fumettologica Magazine. Retrieved March 30, 2015. ^ Hornyak, Tim (August 19, 2007). "Osamu Tezuka: Fighting for peace with the Mighty Atom". The Japan Times. Retrieved January 6, 2015. ^ a b "Seibu reo māku yunifōmu ni hatsu tōjō! Oyagaisha 100 shūnen kinen" 西武レオマーク　ユニホームに初登場！親会社１００周年記念. Sponichi Annex. December 19, 2013. ^ "Jungle Emperor appears on the uniform of Seibu Lions! : News : TezukaOsamu.net(EN):". TezukaOsamu.net. Retrieved March 14, 2014. ^ a b Schodt (2014), p. 272. ^ "Designer Hiroaki Ohya Speaks on LACOSTE L!VE x Osamu Tezuka Collaboration". lifeandtimes.com. Retrieved March 24, 2014. Schodt, Frederik L. (2014). Dreamland Japan: Writings on Modern Manga. Stone Bridge Press, Inc. ISBN 0-7567-5168-3, ISBN 1-880656-23-X. Schweizer, Peter; Schweizer, Rochelle (1998). Disney: The Mouse Betrayed. Regnery Pub. ISBN 0-8952-6387-4.